It’s been warm today. Balmy to say the least. Thirteen degrees Celsius is not at all typical for December in Nova Scotia. Odd weather occurences are becoming more frequent than usual this year, already predicted to be the warmest in Canadian history. 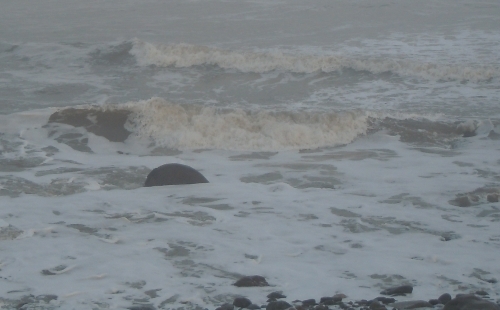 But this afternoon, even news of surfers in Fisherman’s Cove came as a bit of a surprise. I wasn’t able to get out to see the action in Eastern Passage, but I did get a few images of the waves in the Cow Bay area towards Rainbow Haven beach. The whole sea appeared to be in the process of being stirred up by an invisible hand. Both the number and size of the waves were remarkable. What was even odder was the number of flies hovering in the air. (You might be able to spot some in the photos). Though I didn’t walk down to the shore, I imagine they would have been swarming in even greater numbers near the seaweed that’s been churned up over the past day. I hope all the surfers had a great time trying to catch the Big One. 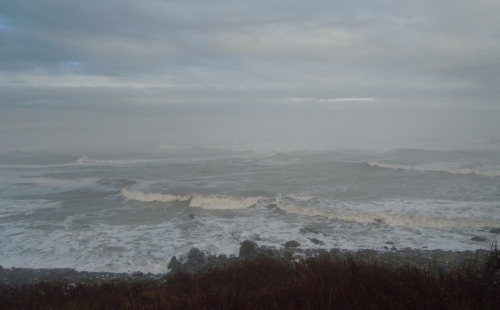 Sybil at Eastern Passage Passage managed to capture surfers in the images she took of today’s waves at Fisherman’s Cove. You can visit her post at Surf’s Up. How strange! It’s as if you’re having weather we had weeks ago! 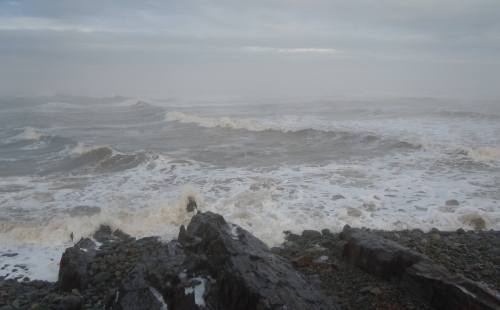 Waves and froth and foam and warm, balmy air and insects—can this be December in the North? Your prediction really is for the warmest winter in Canadian history? Are more Canada geese spending the winter north of the border this year? 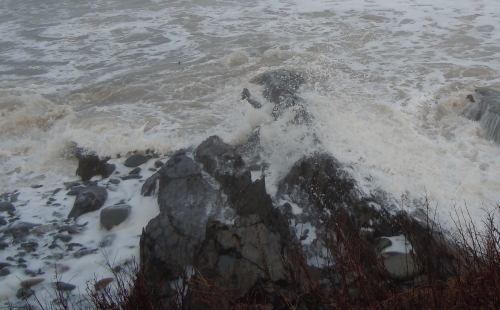 Cow Bay looks positively wild in your photographs today. The waves today seemed bigger than during Hurricane Earl ! Those are wild and woolly waves, Amy. I can’t imagine people surfing in them–can’t imagine being in the water when it’s that cool, even if it is unseasonably warm! Meanwhile I’m freezing my various valuable body parts. Interesting times. Wild and woolly indeed Gerry. Today’s warm weather is certainly easier to tolerate than the cold you are experiencing. However, we will need a deep freeze eventually this winter to zap the insect population. Otherwise they’ll become a problem come next summer. Thanks a lot Amy for the photos…such awe inspiring images, no doubt there a sea God too. Someday I hope to see such beauty live, may be even surf…sigh. Very impressive images and unusual weather you describe. Somehow, living in a country with no access to the sea, I always associate it with the long drive that brings you to the Mediterranean, and that is Summer. Holidays. Seeing the shades of your pictures and those wicked waves is quite a discovery for me. Beautiful. Snow is falling in blankets today in the Midlands, UK… hope my Other Half gets back OK with the shopping! I can hear them! The weather’s been very changable this December here as well. Thanks for sharing this day. I want to wish you a very happy holiday and all the best for 2011. We have rain, rain, rain out here. Boyfriend intends on going surfing on Xmas Eve-day, if it lets up even the tiniest bit. But a rainy day on the beach is lovely too even without surfing – watching the birds negotiate the gray wind above the blustery waves. One could watch their artistry forever. The waves of change. Are you getting the big Nor-easter today? More waves but much colder weather. Scott, that Nor-easter never amounted to much here, though it did bring some cold winds and freezing temperature today.